Having spent many years working at different resorts, an intriguing question still remains frequently asked by the tourists. Is Maldives going to sink and disappear from the face of the world? In light of my experience at various islands in the Maldives these are facts I can reveal. There has been many studies on the environmental impact of global warming. The global warming makes sea level to rise. This is alarming news for the low lying islands of Maldives of which most of the islands are less than a metre above sea level. Photo: palm tree about to fall as soil beneath has been eroded away. The sea level actually changes every minute and completes a cycle every 24 hours, within the cycle there is a high-tide and a low-ride. Timing of high-tide and low-tide also keeps on changing over the months. In general, most of the islands at high-tide are just 1/2 metre above sea level. If the sea is rough and windy it often creates swell which makes the banging waves flow over the beach and reach inner land areas, sometimes damaging property. Capital Male' is often seen just mere inches above sea level, roads near IGM Hospital gets partly flooded by salt water gushing out between the road bricks. The geography and the environment of the Maldives is highly sensitive. An inch of sea level rise means life threatening in the years to come. 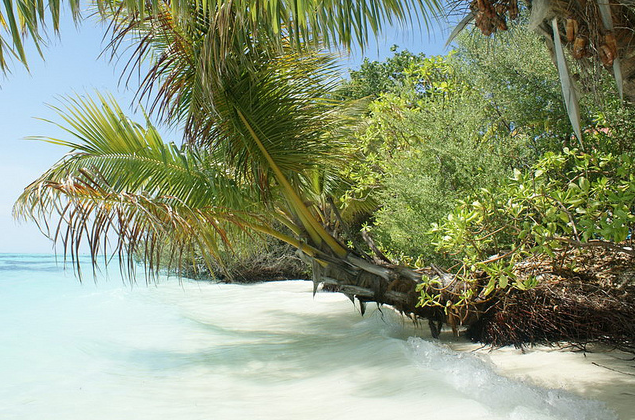 Beach erosion has been happening to many islands of the Maldives, at least for the past 30 years. The sand gets eroded by the water, trees are fallen down from the root. In my childhood I played volley ball on the beach, after 15 years it became part of the lagoon. This may be the best indication that sea level is rising and Maldives is slowly sinking. Some argues the impact of beach erosion is the result of humans civilisation - people alter natural formation of land by making ports, jetties for access. That may be partly true as most of the inhabitant islands have recorded more soil erosion. But not completely, the uninhabited islands are also suffering from beach erosion in many parts of the Maldives. 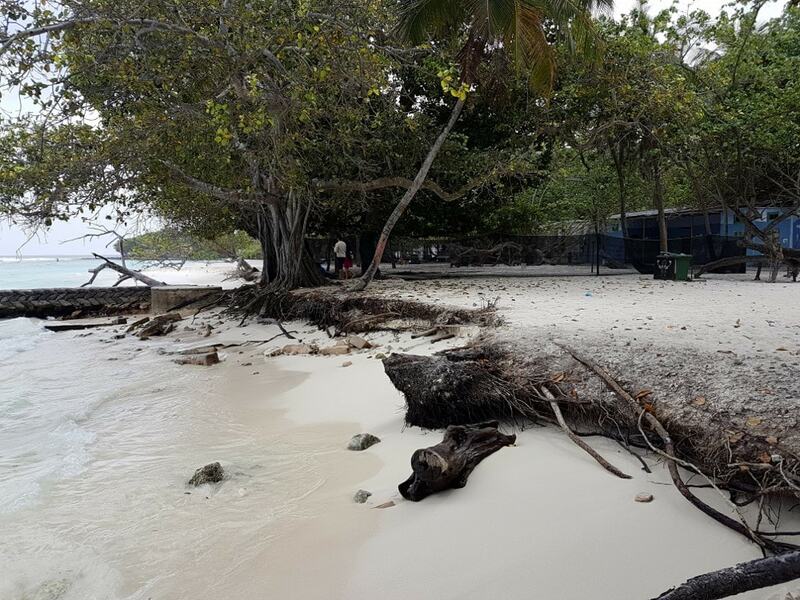 Photo: Vili-Male' island captured on 20 February 2017 shows severe beach erosion making 70 year old banyan tree about to fall off. There has been theories that the islands are also growing as level rises. But, so far there has not been any concrete evidence to support this theory, especially in presence of widespread beach erosion across the Maldives.